Home / Political Thoughts - the magazine / We need to talk about China. We need to talk about China. China is now the richest country in the world in terms of the Purchasing Power Parity (PPP) measure of GDP. Its towns are modern tower blocks, its motorways are enormous and full of traffic and its factories are booming. It has almost five times the population of the USA. On the standard measure of GDP china is a clear second in the world and its economy is rapidly growing to exceed that of the USA in the next decade. Money means power and the risk from China to the West is becoming existential.See Bloomberg Article I am a sinophile. In the noughties it seemed fantastic that at last the long suffering Chinese were getting the prosperity and, perhaps, movement towards the government that they deserved. Then I saw the black uniformed security police, especially in the West of China. China is now the richest country in the world in terms of the Purchasing Power Parity (PPP) measure of GDP. Its towns are modern tower blocks, its motorways are enormous and full of traffic and its factories are booming. It has almost five times the population of the USA. 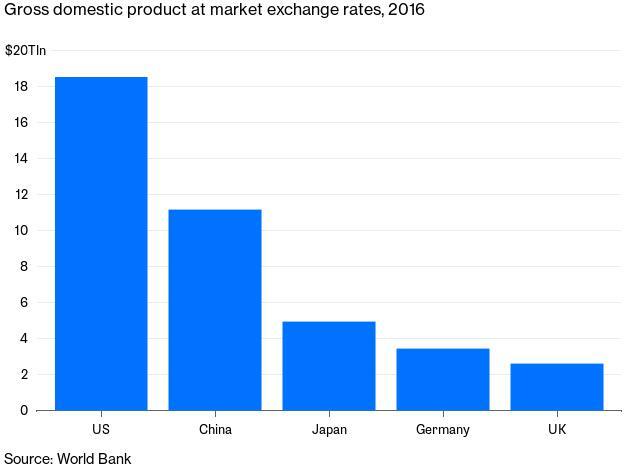 On the standard measure of GDP china is a clear second in the world and its economy is rapidly growing to exceed that of the USA in the next decade. Money means power and the risk from China to the West is becoming existential. I am a sinophile. In the noughties it seemed fantastic that at last the long suffering Chinese were getting the prosperity and, perhaps, movement towards the government that they deserved. Then I saw the black uniformed security police, especially in the West of China. I also noticed that if you mentioned Tiananmen Square the people used to smile and even say "I cant talk about such things" but now they are obviously afraid and may be silent or abruptly change the subject. Something is going badly wrong in China. China demonstrates that the theory that capitalism and prosperity brings political freedom is false. It is a dangerous lie. The alarm bells should have been ringing like air raid sirens when Xi Jinping became President for life in March 2018. The recent Anti-Terrorist Act (2015) passed by the Chinese government defines terrorism as: "Any advocacy or activity that, by means of violence, sabotage, or threat, aims to create social panic, undermine public safety, infringe on personal and property rights, or coerce a state organ or an international organization, in order to achieve political, ideological, or other objectives". This means that anyone taking a political position on property use or who suggests industrial action or even has a petition to put pressure on communist party officials is at risk of becoming a terrorist. The UK and USA use Common Law which allows the judiciary to balance new Acts against previous conventions, China (and the EU) do not have this safeguard which means that the Chinese can label dissent as terrorism and make the terrorists disappear without intervention from the courts. Sadly even in the US and UK the use of extra-territorial detention and the UK Prevention of Terrorism Act have reduced the power of the Courts markedly. China is not alone in using anti-terrorist laws to impose State control, for example, the Saudis use anti-terrorist legislation to arrest and condemn atheists, but where China differs is in the methods used to impose that control. The real problem confronting the Chinese is that they live in the first State to be controlled by Information Technology and AIs. This is a terrifying development. As part of "anti-terrorism" legislation the Chinese government is requiring Chinese electronics companies to put hardware "backdoors" in their products so that the security services can listen in to mobile and internet communications. This does not just apply to Huawei and ZTE who provide cheap smartphones and smartphone equipment, it also applies to a wide range of Chinese electronic products including computers and integrated circuits (ICs). These Chinese "hardware backdoors" or "hardware trojans" recently formed the substance of an article by Bloomberg Businessweek. 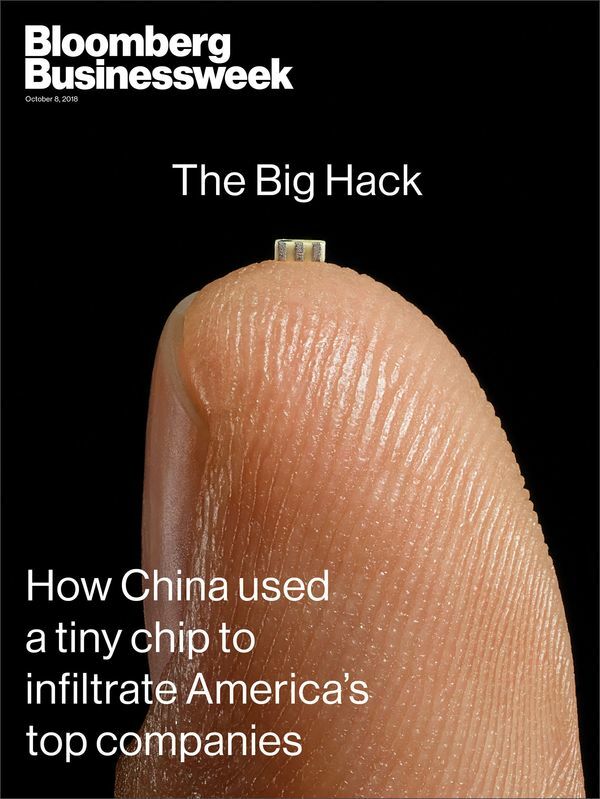 The Bloomberg article covered minor mdifications to circuit boards that allowed Chinese hackers to gain access to computers that had been supplied to the US Government, Apple and Amazon amongst others. The "backdoors" found by the Bloomberg contacts, although tiny and almost impossible to find, were much more obvious than the hardware trojans that Chinese computer chip manufacturers will almost certainly be placing inside their products to comply with the law. The US Government has been aware of the problem of Chinese sourcing of computer components for at least a decade and the Obama Administration was also concerned about it. The US Defence Science Board produced a thorough report on the problem called Resilient Military Systems and the Advanced Cyber Threat 2013 which finds that modified integrated circuits (hardware trojans) are exceptionally difficult to detect and a huge risk. The lack of detection of trojans in Chinese supplied microprocessors and integrated circuits does not mean that they are not there, it just means they cannot be detected. This leaves the West in an impossible situation in which it is sourcing up to 70% of its computing hardware from a country that has announced that it is including backdoors for its security services in its products. It also means that Western industries and defence forces are wide open to Chinese attack if conflict were to occur and may even in peacetime suffer attacks from unknown sources if it suits the Chinese to shut down a Western Bank or company. Chinese spying on foreign persons and governments is bad but the spying is far worse in China where communications are all monitored and also controlled. All internet traffic into and out of China is screened by the Great Firewall of China. Google has been banned from China and the Chinese use a search platform called "Baidu". Enter "Tiananmen" into this search engine and you will probably still find the top article in English is "Tiananmen Massacre a Myth". Microsoft and Yahoo have Chinese operations that obey Chinese Internet Law. Baidu forwards all searches to the security services. Inside China the Golden Shield operates which employs AIs and about 30000 security police to monitor all internal Internet traffic for subversive content. Business Insider has summarised a top 10 of Chinese security methods. This includes monitoring mobile phone photos using facial recognition software, videos, calls and online shopping, providing police with "Google Glass" type spectacles to recognise and flag up suspects in crowds, tracking social media posts and using AI to collate lists of potential threats to the State from the information collected. The Chinese are now rolling out a "shadow banning" system nationwide where people are ranked according to their employment, online, banking, social media and other activities and denied advancement and even credit if their score is low. It is probably now impossible for any grass roots resistance to the Chinese system to grow or propagate. The poor Chinese opposition forces have no hope: oppose the Chinese State and State Security will definitely find out, oppose the Chinese State a little and you will be a low paid clerk for the rest of your life, oppose it a lot and you will become a terrorist with the "appropriate" punishment. How does the Western Media respond to China? The growth of the Chinese threat is directly due to the opening up of the Chinese economy by Western Multinational Corporations. Not only did they transfer key technologies in exchange for rock bottom production costs using virtually slave labour but they actually assisted China in its creation of the Great Fire Wall and lobbied Western governments to allow China to be part of the World Trade Organisation. "Trade will bring liberty and better relations" was the Multinational mantra, repeated by their journalists in their media and in Internationalist organs such as the BBC. In the noughties the Chinese could do little wrong according to journalists. The BBC account of Chinese economic growth fails to mention that it has created any danger for us or the Chinese people. CNN follows the same line. The Guardian even promotes the growth of Chinese influence. How can journalists have got it so wrong? I must confess that I was also taken in by the "liberalisation" of the Chinese economy in the noughties but in the last decade there is no excuse for ignoring what is happening in China. The recent Western Media coverage of the US-Chinese Trade difficulties as an American attack on the World Order is particularly worrying. There is no doubt that Multinational Corporate Interests and Chinese interests coincide. In particular companies like Amazon, Apple and Google Android devices have a huge exposure to Chinese electronic supplies. All of them use Chinese Integrated Circuits and processors in their equipment and all have been naive enough to supply their customers with products that are probably easily hacked by Chinese State Security. This use of compromised equipment by most of us is possibly of little importance but when that equipment is used by members of government, generals, corporate CEO's, development laboratories etc. it becomes a huge risk and Amazon, Apple etc. can do little except deny absolutely that it affects their products. Apologists for the appalling mess that the Multinational Companies have created with their distributed supply chains will declare that "of course, the Western Security Services do the same thing as the Chinese" but are wrong on three counts, firstly most Western countries have not permitted anywhere near the depth of penetration of privacy that the Chinese permit, secondly the US and UK have legal systems that can challenge the State and thirdly China has become dominant in the supply of some types of electronic equipment in a way that even the USA cannot match. The argument by Multinationals that their distributed supply chains benefit us all is just a cover for reckless behaviour from employing slave labour to empowering those who may very well prove to be our nemesis. The asymmetric trade with China is possibly an even greater risk than the real possibility that the Chinese can eavesdrop on most smartphones and computers. The Western Trade Deficit with China means the West is supplying China with trillions of dollars to buy up foreign companies and extend their influence globally. There can be no doubt that Chinese Capitalism - capitalism without democratic control - is now a greater risk to us all than was Chinese Communism. We must all realise that unfettered global trade (what Multinationals call "Globalization") benefits multinational companies and the Chinese and it is not the path to liberation.